...I finally moved out after starting to think about it about 6 years ago and then being made redundant. ... and following on from the one above, I moved to Cheltenham. ...I more than trebled my Instagram following and have just managed to break through 1k followers (despite the ridiculous new algorithm). ...I received a new research grant from the Swedish Society for Psychical Research (SPR) so I can continue the research I did for my PhD. ...I had my first car accident (I've been driving for about 15 years). I was hit by an Eddie Stobbart lorry. There was no damage to me or my boyfriend just a little bit to my car that was mostly cosmetic but had to be fixed because it clipped my wheel. ...I stopped looking at the stats for my blog (unless I need to). They make me feel like I'm not good enough, like nobody reads my blog (which maybe they don't) so I stopped looking at them and just concentrated on enjoying blogging. ...I started dancing again (briefly) after a six year break. I've had to stop again because it's not really something I can afford right now, but I've missed it and will hopefully start again soon. I danced for about 20 years. 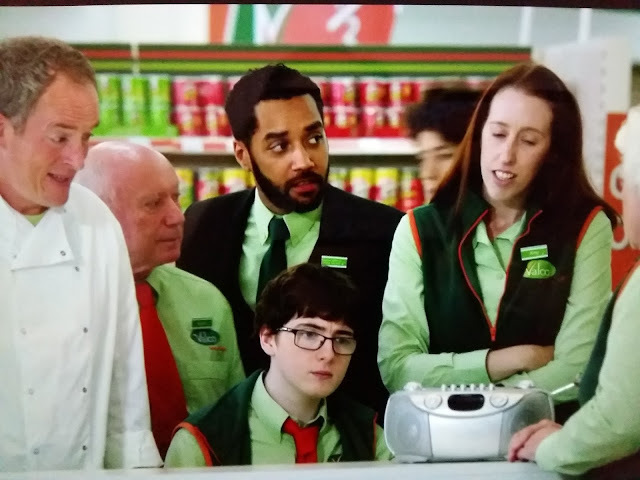 ...I returned to Sky 1 comedy Trollied in a regular role as a Valco staff member and had my first walk-on role. I also worked on the Christmas episode this year. ...I had to put my life on hold for four weeks to make 12 muppet type puppets for a game my boyfriend was running at a convention in Bournemouth in November. They were a huge hit and I've had three orders for me to make puppets or people. ..I gave up on being a redhead after about 6 months. ...I haven't got a publishing deal for the results of my PhD research yet. ...I didn't get a role in the new Guardians of the Galaxy film (but I can't wait to see it) and I didn't get a role in Sherlock and the series starting tonight (Jan 1st) is the last series. ...I will get the publishing deal for the results of my PhD research. ...I will start my own business, but I'm not telling you in what. ...That Supporting Artist work will pick up again as the last couple of years have been pretty dire! How was 2016 for you? Happy New Year!